This is where we will keep old news items (2017-2011) that were previously featured on the Home/News page. Click here (2010-2005) and here (2004-1999) for further archived news items. Glenn Hughes will be appearing at NAMM 2019 in Anaheim, California, USA on Friday, January 25th and Saturday, January 26th for Signing and Meet 'n Greet sessions. For the first time in 40 years fans in South America will witness Glenn Hughes, The Voice of Rock and one of the finest musicians of his generation performing a full concert of Deep Purple classics live! Kicking off in Chile on April 12th, 2018, the tour runs until April 29th, 2018 in Brazil. September 22nd is the release date for 'BCC IV' by Black Country Communion. It expands upon the progression that took place between the first three albums. With an abundance of heavy riffs, undeniable hooks, melodic flair and infectious choruses, BCC IV is a spectacular album that gets bigger and bolder with repeated spins. For the first time in 40 years Australia and New Zealand fans will witness Glenn Hughes, The Voice of Rock and one of the finest musicians of his generation fronting a mighty handpicked band. Kicking off in Sydney, Australia on September 20th, he revisits some of Deep Purple's all-time greatest songs. Glenn along with Joe Bonamassa, Jason Bonham and Derek Sherinian recently completed laying down new songs for the upcoming fourth album from Black Country Communion, due out on September 22nd, 2017. Full details and music previews are expected by early August. Glenn will join The Music Of Cream 50th Anniversary Tour in Australia and New Zealand. The line-up features Malcolm Bruce (Jack's son), Kofi Baker (Ginger's son) and Will Johns (Eric's nephew), alongside fellow special guest, Grammy-nominated guitarist Robben Ford. The shows start in Melbourne, Australia, on May 23, wrapping up in Auckland on June 2, and celebrates the 50th Anniversary of Cream's all-too-brief heyday via the bloodlines of Messrs Bruce, Clapton and Baker. Glenn has now completed his "Resonate" tour of UK and Europe, with outstanding reviews received from fans, press and media. You can now find some photos, video and setlists via the "Tour Pix" section of the site. Published to coincide with Glenn's Storyteller Session at the Cafe de Paris in London, UK on February 25th, 2017. This hardback edition will be made available to fans at selected Glenn Hughes shows and events. There are currently no plans for wider distribution. A Storyteller Session celebrating Glenn's life in music will take place on February 25th in London, UK. This special event, held at London's historic Cafe de Paris, is a must do for all Glenn Hughes fans and tickets are strictly limited. Tickets are on sale now! A Limited Number of VIP Upgrade Packages are available for all dates on the upcoming 2017 Tour of UK and EUROPE. Packages On Sale Now For All Shows On The Tour! Glenn Hughes is pleased to announce his 2017 tour of UK and EUROPE to take place in January and February, following the recent release of his new solo album, RESONATE. Tickets will go on sale to the general public from 10:00AM Friday, November 25th. Glenn Hughes first solo album in 8 years, "RESONATE", was released on October 28th, 2016 in Japan via Ward Records and today across the rest of the world via Frontiers Records, with a Vinyl edition set for release via Frontiers' label partners Soulfood Music on November 11th, 2016. Joining him on the album are his guitarist and album co-producer from Denmark, Søren Andersen, Swedish drummer, Pontus Engborg, and Australian keyboard player, Lachlan "Lachy" Doley. Making a guest appearance on drums for 2 songs is Chad Smith (Red Hot Chili Peppers). UK based, and available worldwide, Planet Rock, have just added Glenn's new single, "HEAVY", to their playlist. Planet Rock is the number one rock radio station in the UK and gets 1 million listeners a week! You can now let them know you wanna' hear more Glenn Hughes and his new single, "HEAVY", via their Facebook page or website. My heart is yours South America. Thank You for your amazing attendance and Sold Out shows. Next up Europe. See you in November. Glenn Hughes has just added shows in South America to his 2016 Solo Tour after last years' triumphant return to the region in almost 10 years. The shows will encompass 3 countries and 8 cities, all taking place in September. To all who came to my first Solo USA Tour - I love you so much. It was an incredible experience & brought me to tears at the end last evening in Hollywood. I'm so grateful to have such wonderful friends, followers and fans who show up every night. You make a difference. ...next up South America - I'm so ready!! Rock and roll legend Glenn Hughes is rescheduling his recently announced US headline tour. The tour that was originally set to begin on March 2nd in San Jose, CA is now set to begin on August 9th in Annapolis, MD. The 64-year old icon recently underwent dual knee replacement last month and delays in the recovery from those operations are the reason for the reschedule of the tour. Glenn Hughes will release his first solo album in 8 years in late October, early November this year via Frontiers Records. After a busy couple of weeks recording at Medley Studios in Copenhagen, Denmark, mixing is also now complete and Glenn is heading home! Fans must have a concert ticket to purchase VIP Upgrade Package. Glenn Hughes is featured on a new song by Billy Ray Cyrus, a reworking of the Bryan Adams song, "Hey Elvis". Written by Cyrus, Adams, Hughes, it will be featured on the new Billy Ray Cyrus CMT TV series, "Still The King", which will debut on June 12th, 2016 in the USA. Glenn Hughes and Robin Zander as 2016 Rock & Roll Hall of Fame Inductees will be honored by Adopt The Arts on Thursday, May 12th, 2016 at The Fonda Theatre in Los Angeles, California, USA. Tickets are on sale now! Glenn Hughes will be a guest of John Varvatos for a very special evening on Wednesday, April 6th, 2016 in New York City, to celebrate his induction into the Rock & Roll Hall of Fame, as a member of DEEP PURPLE MKIII. Fellow DEEP PURPLE MKIII bandmates, Ritchie Blackmore, David Coverdale, Ian Paice and Jon Lord (posthumously) will also be inducted. GLENN HUGHES is pleased to announce his first ever live show in Singapore, which will also round out his 2015 Solo Tour. Joining Hughes will be DOUG ALDRICH (Revolution Saints & formerly Whitesnake, Dio) on guitar and powerhouse Swedish drummer, PONTUS ENGBORG. With recent sold out live shows in South America and Europe, GLENN HUGHES, the legendary 'Voice of Rock', is extending his Solo Tour throughout 2016 beginning with new Spring-time shows in the USA. If you want a GLENN HUGHES shirt before going to any of the upcoming shows in EUROPE and UK or perhaps you won't have a chance to pick one up at the show, you can now get one right here at the website! If Glenn's not currently playing in your town or country, this is the perfect collectible or gift from the 2015 tour of EUROPE and UK. Hurry while supplies last!! GLENN HUGHES is pleased to announce his return to Japan. Joining Hughes for the shows in Tokyo, will be DOUG ALDRICH (Revolution Saints & formerly Whitesnake, Dio) on guitar and powerhouse Swedish drummer, PONTUS ENGBORG. It will be Hughes' first Solo live performances in the region for over 15 years. Glenn Hughes returns to South America for his first Solo live performances in the region for almost 10 years. The South American shows will encompass 3 countries and 8 cities, with more dates and more countries to be announced very soon, all taking place in August. Joining Hughes, will be Doug Aldrich (Revolution Saints & formerly Whitesnake, Dio) on guitar and powerhouse Swedish drummer, Pontus Engborg. Glenn Hughes is extending his 2015 Solo Tour with new shows in the UK, spanning mid October into November. Glenn Hughes will be touring Europe in September & October. He will showcase highlights from his colorful career including Trapeze, Deep Purple, Black Country Communion, California Breed along with his own Solo material. More solo shows will follow throughout the year... to be announced soon! Glenn Hughes is excited to announce that Doug Aldrich (Revolution Saints & formerly Whitesnake, Dio) will join his Solo band as guitar player for the upcoming 2015 Autumn tour dates. Alongside Aldrich will be powerhouse Swedish drummer, Pontus Engborg, with Hughes on bass & vocals, completing the Trio. Glenn Hughes reunites with the all-star collective, Kings Of Chaos this Spring, whose core lineup includes ex-Guns N' Roses members Duff McKagan, Matt Sorum and Gilby Clarke, along with ZZ Top's Billy Gibbons, Billy Idol's Steve Stevens and Cheap Trick's Robin Zander, for East Coast USA shows. Glenn Hughes will be a special guest of the 'Masters Of Metal' Rock 'n' Roll Fantasy Camp in Las Vegas, NV., USA on Friday, March 27th! Glenn Hughes will be appearing at NAMM 2015 in Anaheim, California, USA on Saturday, January 24th for a Signing and Meet 'n Greet session. CALIFORNIA BREED and their self-titled debut album have been Nominated for ALBUM OF THE YEAR. CALIFORNIA BREED, have just announced a string of UK dates. The trio will be Special Guests of SLASH featuring Myles Kennedy & The Conspirators. GLENN HUGHES has contributed THE POLICE classic song, "Roxanne", to the ROCK AGAINST TRAFFICKING project formed by record producer and musician, Gary Miller, to raise awareness of the global slave trade. You can read more about the project and listen to Glenn's performance via Billboard.com. CALIFORNIA BREED, have just announced live shows in the USA. They will be the Special Guest of ALTER BRIDGE Coast To Coast Stateside! GLENN HUGHES will be a featured guest on the new Eddie Trunk Podcast, available Worldwide on Thursday, August 14th, 2014. You can listen for FREE via iTunes or PodcastOne. CALIFORNIA BREED, have just announced their first round of European live dates. The band will support Alter Bridge in the USA before heading to Europe and will close out the run supporting SLASH featuring Myles Kennedy & The Conspirators on their 5 UK arena dates. CALIFORNIA BREED will be the featured guests of Bob Coburn on Rockline, on Monday, May 26th at 8:30PM PT (11:30PM ET). They will be taking your questions LIVE on the air @ 1-800-344-ROCK (7625). CALIFORNIA BREED, the new band of 2014, built around the foundation of legendary vocalist-bassist Glenn Hughes, drummer extraordinaire Jason Bonham and 23-year-old newcomer guitarist-singer-songwriter Andrew Watt, debuted at No. 1 on the Official UK Charts 'Rock' Album chart. CALIFORNIA BREED, had their song, The Way, from the just released self-titled debut album, California Breed, issued via Frontiers Records, receive it's world premiere, thanks to BILLBOARD, where you can also find a Q&A with GLENN HUGHES. CALIFORNIA BREED, the new band of 2014, built around the foundation of legendary vocalist-bassist Glenn Hughes, drummer extraordinaire Jason Bonham and 23-year-old newcomer guitarist-singer-songwriter Andrew Watt, have announced their first ever live shows which will take place in Los Angeles and New York at the end of this month! Video clips featuring behind-the-scenes footage from the making of the self-titled debut album from CALIFORNIA BREED, the new band of 2014, built around the foundation of legendary vocalist-bassist Glenn Hughes, drummer extraordinaire Jason Bonham and 23-year-old newcomer guitarist-singer-songwriter Andrew Watt, are now available for you to enjoy! Visit GuitarWorld.com every Tuesday thru end of May for new episodes! CALIFORNIA BREED, released their first lyrical video today via the Classic Rock Magazine website. Taken from their forthcoming self-titled debut album, California Breed, released in May via Frontiers Records; the song is also now available to Download if you pre-ordered the album via iTunes. CALIFORNIA BREED, had their song, Sweet Tea, from their forthcoming self-titled debut album, California Breed, released in May via Frontiers Records, receive it's world premiere, thanks to USA TODAY, where you can also find a Q&A with GLENN HUGHES. Mixing massive riffs, gutsy vocals and gale force rhythms, CALIFORNIA BREED are pleased to announce their self-titled debut album is available to Pre-Order today via iTunes and Amazon. The powerful three-piece band's album will be released by Frontiers Records on May 16th in Europe and May 19th in UK & USA. Available as a CD, Digital Download and also a Deluxe Edition CD + DVD featuring the bonus song, 'Solo', and 2 video clips, plus documentary. If Digital Download is pre-ordered, an Instant Download of the first single, 'Sweet Tea', will immediately be made available. Glenn Hughes and his bandmates announced the name of their new band, which they've been working on the past few months! CALIFORNIA BREED are Glenn Hughes on Bass & Vocals, Andrew Watt on Guitar and Jason Bonham on Drums. Their self-titled debut album, will be released May 16th in Europe and May 19th in UK & USA, via Frontiers Records. Glenn Hughes will join a host of fellow musicians to celebrate the life of good friend and fellow Deep Purple MK III / MK IV member, the late Jon Lord, at the The Sunflower Jam charity’s event, ‘Celebrating Jon Lord‘, to be held at The Royal Albert Hall in London, UK on Friday, April 4th, 2014. Glenn Hughes will be appearing at NAMM 2014 in Anaheim, California, USA on January 24th and January 25th for Signing and Meet 'n Greet sessions. Glenn Hughes will help celebrate the 50th Anniversary of the world famous, Whisky A Go Go in West Hollywood, California, USA. He will be a special guest of Lita Ford for her show on Thursday, January 9th, 2014, performing an all electric version of the Deep Purple classic song, 'Mistreated', as well as sing a duet on one of Lita Ford's biggest songs. Glenn Hughes has just wrapped up his time in a Nashville, Tennessee, USA recording studio with new music for a new band he has put together over the past few months, which will also include a special guest appearance by Julian Lennon on a duet with him. He kept us up to date with day-to-day Studio reports, which you can now read here! Glenn Hughes and Kings of Chaos featuring Slash, Matt Sorum, Duff McKagan, Corey Taylor and Steve Stevens amongst others, played an all-star benefit show in Hollywood for Ric O'Barry's Dolphin Project. Fans and critics alike are giving both the show and the cause rave reviews! Kings of Chaos are an all-star touring project that features Glenn Hughes, Corey Taylor and Steve Stevens along with Slash, Matt Sorum and Duff McKagan. Their only North American show of 2013 will be November 18th in Los Angeles at Avalon Hollywood for a benefit gig called 'Tokyo Celebrates the Dolphin'. Glenn Hughes will perform a song with a string quartet at the Wedding of former Guns N' Roses and current Velvet Revolver & Kings Of Chaos drummer, Matt Sorum on Saturday, October 12th, 2013. Glenn Hughes is a guest vocalist on the September 16th (Europe) / September 24th (USA) release from Gov’t Mule, on their long awaited new album; “SHOUT!“. Glenn is featured on the song, No Reward. This is not just a new album, but a very large and unique project with an all-star lineup of vocalists. Other guest musicians include STEVE WINWOOD, MYLES KENNEDY, DAVE MATTHEWS, ELVIS COSTELLO, BEN HARPER to name but a few! You can now listen to the entire album @ Listening Booth on MSN Music. Glenn Hughes and other former and current members of Deep Purple are featured in the VH1 Classic series, "Beyond The Music Remastered", with their episode debuting tomorrow night in the USA, Saturday, April 27th, 2013; followed by other terroritories at a later date. Glenn will be playing both solo shows and featuring with all-star project, Kings Of Chaos in Australia towards the end of April. Kings Of Chaos will play the Stone Music Festival in Sydney and Glenn will then play 2 special solo shows along the East Coast of Australia, including Melbourne and Sydney. He'll be playing a dual set, kicking off with an intimate acoustic solo set, before ripping into a full electric show. In addition, Melbourne will see him at a Book Signing and StoryTeller session the day after his show there! 88.7-WMMT-FM in Whitesburg, Kentucky will host a “Glenn Hughes Spotlight” including a brand new full length interview with Glenn during their Sunday night “The Rock Show“ broadcast at www.wmmt.org on Sunday, March 31st, 2013 at 10:00PM ET (7:00PM PT). The show is hosted by Greg Napier. You can also listen online via their website, by clicking on the “Listen Live!” image at the top right of their website. Glenn Hughes will be performing at the Rock Against MS All-Star Benefit Concert at the Whisky A Go Go in West Hollywood, CA., USA on Wednesday, March 27th, 2013. Glenn will be joined for his set by drummer, Kenny Aronoff and guitarist, Luis Carlos Maldonado. Other musicians performing at the event include John 5, Ginger Fish, Lemmy, Steven Adler, Blasko, Billy Morrison, Wayne Static, Marky Ramone, Jack Russell and many more. There will be a silent auction at the event to raise money for this worthwhile cause. Glenn and John 5 were guests of the Heidi & Frank show on Los Angeles based radio station, 95.5 KLOS, to help spread the word about the concert. You can now watch their interview here. Glenn will be the featured artist on Rockline on Wednesday, March 20th at 11:30PM ET / 8:30PM PT. "Rockline Replay" is now available, so you can listen in online to the recent interview with Glenn, which also features some of his music from throughout the years. The 'Replay' will be available for 2 weeks only! Rockline is one of the premiere USA based nationally syndicated radio shows. Check out Rockline's official website and navigate to "Stations" to find out where to listen to Rockline on the radio in the USA! Glenn Hughes will be appearing at The NAMM Show 2013 in Anaheim, CA., USA on Saturday, January 26th. British born Bass players, Glenn Hughes and Andy Fraser (FREE) are featured in the January 2013 issue of UK based, "Bass Guitar Magazine", on newsstands now! A full featured interview with acclaimed author and editor of the magazine, Joel McIver, is included! Some wild quotes from Glenn Hughes are featured in a new book, "Led Zeppelin : The Oral History of the World's Greatest Rock Band" by Barney Hoskyns. Find out more; be sure and check it out! Since the Lyrics were omitted from the various Black Country Communion Afterglow album packages, despite being submitted by Glenn, to the art and graphics team @ J&R, to be included as always; for some reason, they were not put on the album. So they are now available to view and optionally, download as a PDF, from the Lyrics section, here on the site! Due to the weather in New York City and surrounding areas, the in-studio taping where Glenn was scheduled to perform, has been cancelled. If things change, you will see a further update here! Glenn will be a guest on an upcoming VH-1 Classic, "That Metal Special" TV show, which is to be filmed on Tuesday, October 30th, 2012 in New York City and which will then be broadcast on Sunday, November 11th, 2012 @ 8/7c. In addition to being interviewed, Glenn will perform some of his songs and also be a member of the very special house band including Brian Tichy and Alex Skolnick plus surprises! On Sunday, October 28th at 7:00PM GMT / 11:00AM PT / 2:00PM ET over @ www.planetrock.com radio in the UK, Glenn will be broadcasting an AFTERGLOW track-by-track Special broadcast playing his favorite songs and talking about the making of the new album by Black Country Communion. Glenn will be one of the featured guests on the Eddie Trunk Live broadcast over @ SiriusXM Channel 39 (Trunk Nation) on Monday, October 22nd, 2012. It kicks off at 6:00PM ET / 3:00PM PT until 10:00PM ET / 7:00PM PT. He will be on air at 9:00PM ET / 6:00PM PT. Glenn will be talking Black Country Communion, Afterglow and more! You can call into the show at 866-315-2663. UK based music magazine, Fireworks, has a new interview with Glenn all about "Afterglow" by Black Country Communion! It includes front page coverage plus a double-page spread in it's latest issue (No. 54 Nov/Dec 2012) available on newsstands this Friday. It can also be ordered online from their website. Meantime, an excerpt is on their website too! 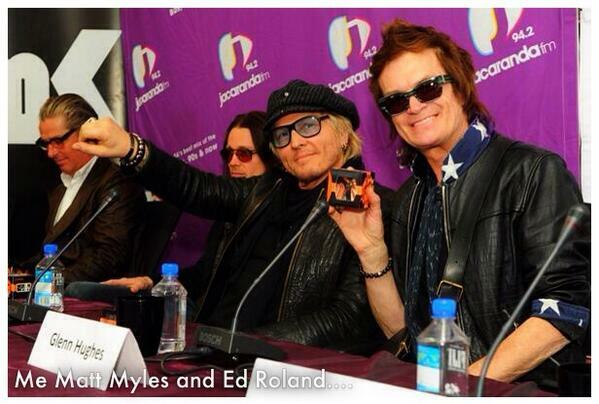 Earlier last month, Glenn was in Paris, France in promotion of "Afterglow" by Black Country Communion. While there he was interviewed by web TV site, TV Rock Live. He talked about the new BCC album, his time in Deep Purple, David Coverdale, Jon Lord and much more! You can now watch the video interview online! "Congrats to all fellow members of Deep Purple for the Rock and Roll Hall of Fame nomination... GH"
You can now find some fan photos and video via the Tour Pix section of the site. Glenn will be center stage as a major line up of some of the world's greatest rock musicians, come together to celebrate the life and work of revolutionary amp pioneer Jim Marshall OBE. It takes place at London's Wembley Arena on Saturday, September 22nd. Glenn will be joined by Andy Fraser, performing a FREE classic, Yngwie Malmsteen with a Deep Purple classic, along with an EPIC finale to feature Joe Satriani, Paul Gilbert, Doug Aldrich, Zakk Wylde and more! Black Country Communion will release their third album, titled, "Afterglow", on October 30th, 2012. Glenn will be making a live appearance on the UK based, BBC Breakfast TV show on the morning of Wednesday, September 19th, 2012. He'll be talking about his appearance at the Marshall event being held in London on Sept 22 at Wembley Arena, Black Country Communion and more! It can also be viewed live on the web (but only within the UK). In a recent ABC Radio News interview Glenn reveals more on a new project he's involved with, Kings Of Chaos and that they will "tour pockets of the world - the exotics, if you will, and the tropics and even America." He said things will kick off April 2013 in South America, where the group plans to hit cities that the Rock N Roll AllStars trek had intended to play before the gigs were canceled. The band's impressive lineup also features Def Leppard's Joe Elliott, founding Guns N' Roses bassist Duff McKagan, ex-GN'R drummer Matt Sorum and longtime Billy Idol guitarist Steve Stevens. "We're gonna do a series of EPs," he explained. "On those EPs there will be three covers and one original song. The lineups with the Kings of Chaos, vocally, will change. The core band will be the same. So, it's gonna be always moving and changing." With the new album, "Afterglow", due in October, early promotion is coming soon and Glenn will be at the forefront once again, so stay tuned for more! Glenn finished up the vocals for the upcoming Black Country Communion album. He had tweeted earlier, October 30th, will be the release date! Although no official release date for the resulting album is currently scheduled, don't be surprised if it's available well before Christmas!! The German edition of the Autobiography has achieved the No.1 position on the Amazon.de "History of Music" book chart in Germany. Following the great success of the paperback edition of the Autobiography which was licensed by Foruli to Jawbone, Foruli have licensed the rights in Germany to Iron Pages. Glenn and former Marillion frontman, Fish, have now completed their double bill run of shows in the UK. You can now find some fan photos, video and setlists via the Tour Pix section of the site. Glenn and his Solo band will be performing for the first time in Israel on July 9th, 2012. Glenn will join the Rock N Roll Allstars in South and Central America in April. He will join a new all-star project featuring Def Leppard singer, Joe Elliot, Gene Simmons (KISS) and former Skid Row singer Sebastian Bach, former Guns N' Roses stars Duff McKagan (bass), Matt Sorum (drums) and Gilby Clarke (guitar), plus Ed Roland from Collective Soul, guitarists Steve Stevens from Billy Idol and Billy Duffy from The Cult and bassist Mike Inez from Alice In Chains. "It's going to be quite a spectacle. For me, this collective of rockers is a fan's dream come true. It's a great lineup with players from a lot of great bands." A double CD edition of Live Over Europe joins the DVD & Blu-ray and is now set for release in February. In Europe, it gets a February 27th release date, which also adds a Vinyl edition and on February 28th it's issued in all other territories. It's available for pre-order now! Black Country Communion will release its first concert DVD, "Live Over Europe", on October 24th, 2011 (Blu-ray to follow November 15th) on the J&R Adventures imprint. The two-DVD live set was filmed with 14 HD cameras and 5.1 Surround Sound during the band's debut tour in the Summer of 2011. In addition, for one night only, on Tuesday, November 1st, 2011 at 7:30PM, participating Vue Cinemas in the UK, will screen Black Country Communion's debut concert film "Live Over Europe" in high definition and Dolby 5.1 surround sound. This one-off rock & roll cinema experience will feature an exclusive filmed introduction from all four members of Black Country Communion, and by pre-booking tickets via www.myvue.com/bcc, you will be automatically entered into a prize draw to win a guitar, signed by the band. - Forging BCC - The Making of "Live Over Europe"
Glenn will be having a Signing Session for his Autobiography, hosted by Sick Boy, at the annual NorthEast MotorCycle Expo, which is being held at the Seaport World Trade Center in Boston, Massachusetts, USA later this month. Glenn will be participating in some Signing Sessions during the annual NAMM show in Anaheim, California later this month. Having recently reached the No. 1 spot on Amazon, the paperback (softcover) edition of the Autobiography written by Glenn Hughes with Joel McIver, is now receiving some outstanding reviews in the media. Glenn's paperback (softcover) edition of his Autobiography is exceeding all expectations in both the USA and UK. It's already the fastest selling book the publisher, JAWBONE, has ever published. Just a few days after publication, the paperback (softcover) edition of Glenn's Autobiography, "From Deep Purple To Black Country Communion", has reached No. 1 on the Amazon.com Rock Reference book chart in the USA and is also ridin' high on the UK Amazon site. Black Country Communion have been nominated in 2 categories in the End Of Year Poll over @ Planet Rock radio. Be sure and add your Vote NOW!! You do have to be a member of their VIP Club on their website to vote, but it's FREE to join - so don't hesitate to sign-up and get your Vote in now! In a double bill featuring full band shows by two legendary and iconic classic rock vocalists, both Glenn Hughes and former Marillion frontman, Fish, will take to the stage for a trio of UK shows in May 2012. Glenn has now completed his special acoustic, "An Evening With...", run of solo gigs in the UK, with excellent reviews received from both fans and media alike. You can now find some fan photos, video and setlists via the Tour Pix section of the site. In related news, the paperback edition of his Autobiography has been flying off the shelves around the world, reaching many different publishing charts, just days after being made available. If you're going to one of the shows in the UK, you can either bring along your copy or buy one at the venue, where Glenn will personally sign it for you! Glenn will be a guest guitarist (bass) on an upcoming edition of "That Metal Show" on the USA based cable TV channel, VH-1. It was filmed on Wednesday, October 19th, 2011 in Los Angeles. The 2 episodes Glenn will be featured on will premiere on Saturday, November 19th (Slash and Sam Dunn) and Saturday, December 17th (Sully Erna and Jesse James Dupree) - both at 11:00PM. Hosted by Eddie Trunk, Jim Florentine and Don Jamieson, the show is now in it's 9th season. Glenn and Black Country Communion received the 2011 Breakthrough Award this evening in London at the annual Classic Rock Awards. "Every year tremendous musicians come through, refreshing, revitalising and renewing the genre. This award recognises those musicians who have taken it a stage further, turning critical acclaim into more mainstream success." On a recent episode of USA cable TV channel, VH-1 Classic’s, “That Metal Show“, Black Country Communion was unanimously named the No. 1 Rock/Metal band of the last 10 Years. Glenn has joined the ranks of the new social media network called Google+, recently started by Google! You can join him on there by using either of these links - one more friendlier and easier to remember than the other! Glenn and Black Country Communion have now completed their run of UK shows. It started with triumphant appearances in Ireland and Wales and took them to all points North and South! Joining them on this leg of their European tour were MSG featuring Michael Schenker. You can now view some pix and fan filmed video footage from the shows, along with setlists. The last episode in Glenn's exclusive weekly radio show on Planet Rock is on Sunday, August 28th at 6:00PM GMT (7:00PM CET / 10:00AM PT / 1:00PM ET). If you'd like Glenn to return in the future, be sure and contact Planet Rock to let them know! The tour of Europe has now concluded. Encompassing SOLD OUT gigs across the continent, the band are now heading home. Black Country Communion have received many accolades for these shows from both fans and media alike. Some shows have been filmed for a DVD/Blu-ray which is currently scheduled for release well before Christmas! Glenn and Black Country Communion will be featured on an upcoming 90 minute HD television broadcast in the UK on Sky Arts Channel 243/244. It will include Black Country Communion performing two songs, "One Last Soul" and "Crossfire", plus an interview with Glenn Hughes and Joe Bonamassa. The limited editions of Glenn's Autobiography, published by Foruli, are now shipping. Glenn received his personal copy last weekend just before Black Country Communion hit the stage at the High Voltage Festival in London, UK. The Paperback (softcover) edition is now scheduled for publication the first week of November. It can be pre-ordered by using this link. Black Country Communion are up for Band Of The Year and Album Of The Year. You can vote from anywhere around the world! Also nominated are Deep Purple's Come Taste The Band for Reissue Of The Year and the MKIV Phoenix Rising DVD for Film/DVD Of The Year. Glenn and Black Country Communion have now completed their string of Summer dates in the USA which received rave reviews from both fans and media alike. They have now begun their tour of Europe and are preparing for the DVD/Blu-ray shoot while in Germany. Meantime you can now checkout setlists, photos and videos from the shows so far! Black Country Communion are currently No. 1 on the Official UK Top 40 Rock Album Chart and riding high at No. 23 on the Official UK Top 40 Album Chart. Later today, you can visit the Rockline website to listen to a replay of the show from last night. Questions from host Bob Coburn and calls from fans, plus new music from "2" were all included! For a station near you and for information regarding how to log onto the Internet for the broadcast go to www.RocklineRadio.com. Glenn and Black Country Communion have just issued the official music video for one of their new songs, "Man In The Middle", from their upcoming album, "2". A few days ago they issued some behind-the-scenes footage while recording the song in East West studios, Los Angeles back in January. Glenn will launch an exclusive weekly radio show on Planet Rock from Sunday, June 5th at 6:00PM GMT (10:00AM PT / 1:00PM ET). Every week, Glenn will choose his favorite rock songs, and seminal tracks that have influenced him over the years, plus songs that continue to inspire him today. With the tour of the UK now complete, Glenn and his solo band are now heading home for a well earned rest before their individual Summer gig schedules kick-in! Excellent reviews of the gigs have been reported, as well as photos and video appearing. Be sure and visit the "Tour Pix" section of the site and check some out! Glenn and Black Country Communion have made available a FREE download for a song from their forthcoming album, "2", released in the U.K. on June 13th via Mascot Records, and June 14th in the U.S. on the J&R Adventures label. So go grab your FREE download of their new single, “The Outsider“ NOW! '2' is now available for pre-order! Black Country Communion, the Anglo-American rock supergroup featuring the talents of bassist/vocalist Glenn Hughes (Deep Purple, Trapeze, Black Sabbath), blues rock guitarist/vocalist Joe Bonamassa, drummer Jason Bonham (Led Zeppelin), and keyboardist Derek Sherinian (Dream Theater), has announced the title of its much-anticipated second album, produced by Kevin Shirley. The album will be called "2" and will be released in the U.K. on June 13th via Mascot Records, and June 14th in the U.S. on the J&R Adventures label. Scenes From The Life Of A Rock Star". Click on pages to view Full Screen and then flip! A Paperback (softcover) edition will be published through JAWBONE in November. It will contain the same text as the hardcover binding, but it will not be fully illustrated or include premium features, as do the currently available limited editions. From Deep Purple To Black Country Communion". The Paperback (softcover) is now available for pre-order. Glenn and his solo band have arrived in the UK and are ready to begin an 11 date tour covering all corners of the country. Kicking off TONIGHT, Saturday, May 14th in Northampton and ending in Birmingham, it promises to be one of the many highlights Glenn has planned for you in 2011! Glenn's long awaited Autobiography gets it's first release TODAY! "We are pleased to announce that there will be a launch event in London for Glenn's book this evening - Thursday, 12th May. We have invited everybody who has pre-ordered a copy of Glenn's book and record package, but would also like to extend an invitation to Glenn's wider loyal fanbase. Anybody who would like to enter a draw to receive an invitation to the event should please email their name and the title of the first track on the first Black Country Communion album to glennlaunch@foruli.co.uk - all entries will be entered into a draw to receive one of twenty invitations to this exclusive event." For those that pre-ordered, your invitation by email has now been sent. Black Country Communion featuring Glenn Hughes will be performing on the Main Stage at the celebrated High Voltage Festival on Sunday July 24th in London's Victoria Park. High Voltage will be the band's only UK festival appearance during the summer of 2011. Glenn recently participated in a Question and Answer session with the organizers, fielding both their questions, as well as from fans across the world! Black Country Communion is pleased to announce a series of 5 major headline UK summer concerts in Wales and the North of England. It has also today been confirmed that the legendary Michael Schenker Group (MSG) will support Black Country Communion on their forthcoming UK concerts. In a pairing that unites one of the most well-respected metal guitarists of all time with the hottest rock and roll band for years, the pair join forces in Llandudno @ Llanddudno Cymru Arena (July 23rd), Leeds O2 Academy (Tuesday, July 26th), Newcastle O2 Academy (Wednesday, July 27th), Glasgow O2 Academy (Friday, July 29th) and Manchester Academy (Saturday, July 30th). Glenn will be in New York City next week promoting '2', the upcoming album from Black Country Communion. by Eddie Webb at 7:00PM ET. For those in the USA you can now view the episode online of "That Metal Show" featuring Glenn. Glenn will be a guest on an upcoming edition of “That Metal Show” – on the USA based cable TV channel, VH-1 – it will first air on Saturday, April 16th, 2011 at 11:00PM ET/PT. The show in it's 7th season is hosted by Eddie Trunk, Jim Florentine and Don Jamieson. Also guesting on that night's epidsode is Duff McKagan (Velvet Revolver & ex-Guns n' Roses). Glenn and Pat Travers have recently made available a song they recorded together, back in 2000, titled, "Cold". Coincidentally, Black Country Communion also have a song called, "Cold", that will appear on their forthcoming second album, "2". The only thing in common here, is the title!! Glenn recently visited a Hollywood studio, to record a very special version of his song, "Coast To Coast", as part of the Artists For Japan charity, that is helping the people of Japan with donations through the artists that support them. "Got an iPhone or Blackberry? Give this "QR Code" a scan to find out more about the book. Work is progressing beautifully on Glenn's book. We have added a large quantity of extra material, and Glenn and Joel (McIver - British author and co-writer) are writing some more material to reflect the success of Black Country Communion. We are on track to ship copies in May of this year." Along with their already announced European live shows and festival dates this Summer; Black Country Communion; Glenn Hughes, Jason Bonham, Joe Bonamassa and Derek Sherinian, have announced their debut tour dates for the USA. Civic Theatre - San Diego, CA. The Grove - Anaheim, CA. The Depot - Salt Lake City, UT. Murat Theatre - Indianapolis, IN. Hampton Beach Casino Ballroom - Hampton, NH. Starland Ballroom - Sayreville, NJ. 9:30 Club - Washington, DC. Black Country Communion is pleased to confirm that they will perform on the Main Stage at the celebrated High Voltage Festival on Sunday July 24th in London's Victoria Park. High Voltage will be the band's only UK festival appearance during the summer of 2011. Other bands confirmed for High Voltage include Judas Priest, Dream Theater, Jethro Tull, and the Michael Schenker Group. Planet Rock has announced the results from its annual end of year listener survey. The survey, conducted throughout December, had listeners vote for their rock music highlights of 2010. Black Country Communion beat Alice Cooper, Iron Maiden and Muse to top 'Band Of The Year', as well as taking the 'New Band Of The Year' category. The super-group which features Glenn Hughes, Joe Bonamassa, Jason Bonham and Derek Sherinian released their debut album in September and have remarkably only played two UK shows.